Do You Remember the First Book You Bought? I still remember that day as if it had been yesterday. I was nine years old and already an avid reader. I had a little bit of money, pocket money I hadn’t spent on comics and some of the sour gums I liked to eat. It was strange to go to school on a Saturday afternoon. Usually that’s when school was off, but it was a special day, a special occasion, and I was keen on spending what little money I had saved. I still see the entrance of the school, smell the linoleum floor, and heavy chalky air. No other school ever smelled as chalky as this. The display tables took up all the space of the entrance hall and my heart began to beat incredibly fast as soon as I was close to them. I wouldn’t be able to buy a lot. I had to choose carefully and wisely. It wouldn’t be enough money to buy more than one or two books. The used book sale was a charity event. Children had brought the books they didn’t want anymore, and the school library had contributed those, which were not circulated any longer. There wasn’t a lot I loved more than books, not even at the age of nine. My mother always bought me the latest children’s books and the old classics. Whenever she heard that someone sold the books of their older children, she bought those too. That was wonderful and I loved it, still nothing could compare to that day and the used book sale in my elementary school because that day I bought my very first book. I still have it somewhere in the attic. It’s torn, the spine is broken, the pages are loose, but the linen cover is still intensely blue and the little Inuit boy in his canoe is still standing upright on the front cover promising a tale of adventure and a world I didn’t know, a world long gone by now. The title was simple, embossed in bold, black letters: “Nuvat the Brave“ by Radko Doone —or rather “Nuvats grosse Fahrt“ in its German translation. It was one of the books the library discarded, an old book that no child had ever checked out. The book wasn’t only the first book I bought, it opened a door to something, which I have been passionate about ever since – foreign cultures, the promise of strange and haunting tales, other life styles and mysterious rites and habits. A whole wide, wondrous world for me to discover. Which was the first book you bought? When I was in the 5th grade my grade school had a book sale. I purchased two books modified for young reader, “The Battle Of Britain” and “70,000 to 1” both by Quentin Reynolds. I didn’t even know there was a “Battle of Britain” books for younger readers. I love the movie. Thanks for sharing. Published 1953 by Random House Books for Young Readers/Random House, Inc..
Enid Blyton was afavourite but my mum bought them from someone whose kid was much older. I loved reading your post. What a precious memory! My parents and grandparents kept me well supplied with books, and my mom took us to the library once a week, so I spent my pocket money on Donald Duck comic books when I was 9. 🙂 I didn’t buy my first “real” book with my own money until I was in high school. I was on a class trip to England, and in Oxford, our teacher told us we all had to buy one book and give a report at the end of the semester. I purchased Joyce Carol Oates’ Foxfire. I only bought the book because it was the first one that caught my eye; I had never heard of Oates. It was a very lucky purchase though, because I loved the book. It definitely pushed me into broadening my reading horizon. Thanks, TJ and thanks for your memories. I bought a lot of comics as well. Most books came from my mum of my father that’s why I remember the little Inuit boy so well and I think it influenced me in becoming a cultural anthropologist. Foxfire was a lucky find. It was my first Joyce Carol Oates novel too. 🙂 I think the first book we buy is really special in many ways. We were quite poor and my parents didn’t really care about providing us w/books, so it was the library for me, but I asked for (and received) the Hobbit for my eighth BD. The first book I bought was Wuthering Heights. I was 10. Still have it. Book gifts were always special, even though I was a bit spoilt. Your first book wasn’t even a children’s book. That just goes to show that kids can read the classics. Wasn’t it too dark for you? You read Wuthering Heights when you were 10, Guy? Fantastic. And look how that’s turned out! Now that you mention it . . . I’m the opposite. I can’t remember my first CD. Hmmm. I wonder what that was. Dear Caroline, My sense of my first book goes in stages. I was blessed with the fact that my father and mother owned a small wholesale book and magazine company, and from the time I was 5, I worked alongside them. I can’t specifically remember what the first book I bought was, but when I was 5 or 6, I was reading the “Little Golden Books” series, with things in it like “The Saggy Baggy Elephant,” “The Tawny Scrawny Lion,” “Mr. Pyne’s Mixed-Up Signs,” “The Little Engine That Could,” “Tuffy the Tugboat,” and so on and so forth. Then, when I was 9 or 10, I bought a copy of “My Friend Flicka,” about the horse Flicka, which coincided with my first riding lessons at a ranch nearby. Later, when I was about 12, my favorite book was one which actually my grandparents bought me for Christmas (along with some cashew nuts to eat while I read), called “Tomas Takes Charge.” It was about a young Latino boy and his sister whose father disappears for a while, they don’t know why, and they have to get along somehow by themselves until he is with them again (happy ending!). I and my friends at the time also made cinnamon toothpicks by soaking toothpicks in a mixture of cinnamon oil (bought at the time at grocery stores and pharmacies, though you can’t get it now anywhere) and water, and traded them and sold them for things at school. My copy of “Tomas Takes Charge” was redolent of the scent of cinnamon because I held my place in the book with a toothpick sometimes, of the many thousands of times I must’ve re-read it. This part of the story has an even odder twist, which I think you will like. I was just before this past Christmas sitting talking to my brother and his son, my nephew, who was 11 at the time, about the book “Tomas Takes Charge,” and how much I had loved it as a child. What do you know, but on Christmas Day, my nephew presented me with a hardback copy of it, which looked just exactly like the one I had as a child his age! My brother had ordered it for me while I was sitting reminiscing about it, and I was so used to seeing hit sit at his computer while talking to us that I’d thought he was just not paying much attention to what I said, as usual (he said later that it also has another title, something like “Children On Their Own,” or etc.). Finally, I bought tons and tons of Gothic romances as a young and slightly older teen, and then as I grew older, and still was working and making my own money, I bought other things as well, mysteries and comedies and etc., even some quality things. I realize you didn’t ask me for my life’s story, but if you had, it would likely be about the books I’ve read, and what else was going on at the time, so I hope you don’t mind that I bored on so. I loved reading your bookish memories. It must have been wonderful to buy a favourite series. I did enjoy your Christmas story. It’s so thoughtful of your brother. Did your nephew like it as well? I also like the story of the cinammon toothpicks I’d never seen it done but it’s a fun idea. Believe it or not but I always carried a small pill box filled with sea salt bits, which I ate like candy, reading the Winnetou books. I remember My Friend Flicka. We read Astrid Lindgren and Ottfried Preussler as kids and I had a collection of pink, French children’s book. My favourite from that time was a Russian book called “I’m waiting Ninka”. I was twelve then. What are Gothic romances? Authors like Victoria Holt? I used to like her as a teen. Yes, Victoria Holt, Mary Something Stewart, as well as romances by Barbara Cartland, Georgette Heyer, and tons of others by people whose names are not so memorable, because the romances and Gothic romances aren’t so good (I was hardly a responsible critic then!). And I wonder if you also ran across the Classics Illustrated comic books? I also read those from a very young age, which is the reason now that I feel sometimes I’ve read a classic and have to think hard twice as to whether I am merely remembering the Classics Illustrated version or am doing well visualizing the actual book! I’ve not read Mary Stewart but I know many people who love her. I’ve never read classics illustrated but I had a book of retellings of Shakespeare’s pays for children and I feel the same. I always think I’ve read or seen a play but I’ve only read the story. One Mary Stewart that I’ve always wanted to read is a romantic mystery-suspense called “The Moonspinners,” which someone made a film of back in the 60’s, I think. I can remember actually watching part of a scene on tv before my mother realized what I was watching and cut the tv off (too old for me, or on too late, I suppose). I think this one’s set in Greece or the Greek islands, if I’m not mistaken. Someday, I guess I’ll get around to it. I can’t imagine it was a shocking movie. Maybe it was the time. She’s written so many books and every time someone mentions her they mention another title. I doubt if there was anything particularly risque in it, just that it was for adults and (at the risk of showing how old I am now!) I was only 5 or 6 during the early ’60’s. For some reason, I have a connection with Disney and Haley Mills, a real star to me when I was young, but I can’t think that Disney would have made a suspense movie, so I’m stuck for clues. I do seem to recall Haley Mills playing the roles of both twins in the first version of “The Parent Trap,” so maybe she’s just in my mind confused with another (suspense) star who looked like her or something, the lovely Dutch blond hair, the guileless expression, etc. I don’t know Haley Miles. Maybe if I saw her. I seem to remember watching The Parent Trap as a kid. Ah, thanks to our friend the Internet, I resurrected a short video of the movie “The Moonspinners.” It was indeed a Disney movie, obviously for YA and not so much for younger children, and Hayley Mills was the teen star in it. It also starred Eli Wallach, of all people, and other people whose names I’m not as familiar with. Now I’m almost certain that it was the time of evening it was on and not the content that put me in bed too early to catch the rest of the show. I can remember (how did I stray so far away from our topic?) also being sent to bed when I tried to stay up and watch “Duel in the Sun” with Jennifer Jones a year or two later. Now, that WAS adult fare, though tame compared to what people watch now. Sorry for yanking things off course in our discussion, and being so gabby. I guess once youthful and YA memories start flowing they open up a flood of related things! Yes, the memories tend to floww suddenly. I started remmebering late TV watching after you started. But I’m not sure how old I was. I know I was allowed more than others. I used to spend all my precious coins on second-hand books at school (we had frequent book sales), but I can’t remember the very first one. It must have been rather early on. Probably Enid Blyton or Olga da Polga or the Moomins. I still have some obscure books with torn or missing covers in my collection. I don’t think we had any regular sales that’s why this one stuck in my mind and most books were bought by my mother, so the first was memorable. Most of my pocket money was spent on comics. As I grew up in Vienna, it was hard to get hold of English language books. The English Bookshop in the centre was my favourite place, but it was expensive (all those import taxes! ), so we depended on the school booksales. There were a lot of people coming and going and donating the books they no longer wanted, so I was lucky, even if the books were not in the best possible condition. And for German books, I must have had all the tiny yellow editions from Reclam and Suhrkamp. Ah you grew up in Vienna. I’ll be in Vienna in October. I haven’t been there for years. I know what it’s like. We have no English book shops here at all, only book shops with English sections. I still have many of those yellow editions. It’s odd how the memory of buying a book with one’s own money can be so strong. For me it was Natalie Babbitt’s The Search for Delicious. I remember coming home with it – a nice hardcover edition – and spending the whole rest of the day late into the night with it, reading it over and over, being just gobsmacked that it was mine. The first book we buy feels much more “ours” than any other we got, right? Lovely memory. I can picture you so well. I was interested in foreign cultures and archaeology. That’s why I picked that Nuvat book. I don’t think the author is or was famous. Oh yes – ‘Little Women’ with birthday money from grandparents. I took forever to pick it out; a hardcover in a slipcase with color plates. Still have the book, absolutely falling to pieces having been read so many times, but realize looking at the plates now that the artist’s grasp on perspective wasn’t the firmest! That sounds like a lovely edition – even if the artworks wasn’t as good. My first book was very cheap. If I had been given money to go to a book store it would have take hozrs to decide. It’s interesting that almost everyone has kept that first book. I bought a Nancy Drew book…one in a long series of books for young girls about a young amatuer detective by that name. I went on to complete the entire series ( 30-40 books ? ) within the next year or so back when I was probably 8 or 9 years old. It was the start of my book “addiction”. I see, we all started early. Not only reading but buying books. It’s so much fun when your that age to read everything of an author. I’ve never read Nancy Drew. In my case it was Frederica de Cesco whose every book I read. I suppose she wasn’t even transkated into English. I wonder if you still have your collection? This is a great post Caroline. For folks who have made reading an important part of our lives, the story of our early reading experiences seem so important and enlightening. They do indeed open many doors to unexpected places. Thanks, Brian. It’s so interesting to read the comments. I guess your book led you to more sophisticated Sci-Fi later on. 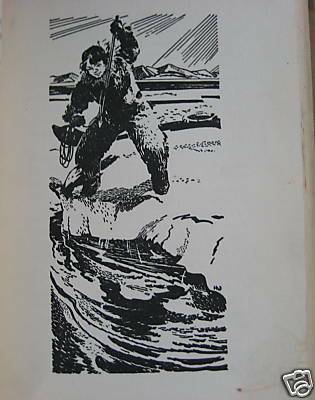 The book I bought was not very literary but a solid adventure story set among the Inuit. And I became a cultural anthropologist. I’ve only just discovered the Battle Star Glactica TV series. What a lovely post, Caroline. We didn’t have school book sales when I was young. We did have libraries, quite a few, with translations. I don’t remember the first book I bought but I do remember persuading my mother to give me money to buy a Jules Verne book I really wanted to read. It was a beautiful hardcover edition. Unfortunately a lady in front of me at the bookstore bought the last copy. I was heartbroken. How sad. I can imagine how that would have made me feel. You wish to buy a book, and then it’s snatched away. My father owned a huge collection of Jules Verne and they all had great illustrations. I only remmeber this one sale. I had very little pocket money because my mum bought almost everything I wanted any way. I didn’t want much as a child. So it wasn’t very ruinous. That day at school was special because I really used my own money. I can’t quite remember the first book I bought, but I do remember the first adult book I was given. My aunt said I could pick any book from her shelves and I picked a thriller. I still have it now, I want to reread it every 10 years or so, so far I’ve only reread it twice. That’s such a wonderful story. I can imagine that would a very special book. And it seems it was a good choice since you re-read it. Another Karl May reader. How nice. We shouldn’t underestimate the influence of early book choices. I edvoured so many Karl May books. They must still be somewhere in my attic. I think I only managed the first two of the Balkan series though. A friend on my parents was addicted to Karl May and thanks to our shared love I got a book for every birthday and one for Christmas. They were rather expensive for a kid to buy with pocket money. Especially those green linen bound ones. I also think he was influential in some of my choices. I forgot the year but the first one I bought was called Three Investigators by Robert Arthur > https://www.goodreads.com/book/show/557103.The_Secret_of_Terror_Castle?from_search=true&search_version=service . I really like it and somehow I have this urge to reread it one day. I loved those Three Investigators books (with Alfred Hitchcock as a character in each one! ), and read them all. I’d be curious to re-read one today. I recently re-read another series I’d loved – John Christopher’s Tripods trilogy – and marveled that it held up so well after so many years. I have never heard that one before. I will look it up in Goodreads now. I will have to look up the Tripods as well. Thanks for letting me know. I think I’ve read those as well as a kid. But I think I got them from the library. I don’t own them. Would be fun to read them again. Beautiful post, Caroline! Enjoyed very much reading about the first book you bought. I think the first book I ever bought was a comic. But if I ignore comics, I think it has to probably be either ‘The Citadel’ by A.J.Cronin or a horror novel omnibus which had ‘Frankenstein’, ‘\Dracula’ and ‘Dr.Jekyll and Mr.Hyde’ in one volume. I used to borrow heavily from the library when I was a child and rarely bought books other than comics. I got these two books in the middle teens. I can’t believe how much I have changed these days because I rarely go to the library and most of the time buy books. I still have the copy of ‘The Citadel’ – it was one of my favourite books when I first read it and it is out of print now. The horror novel omnibus had an introduction by Stephen King and I loved reading that. My cousin borrowed that book and she never returned it. I feel sad when I think about it. Thanks for writing this post and making me feel nostalgic 🙂 I want to come back tomorrow and read all the comments and comment on some of them. I’m like you. I hardly ever use libraries now but I used to as a kid. And very rarely bought books but mostly because my parents bought them. Your horror novel collection sounds great. All the classics. I don’t think I ever read A.J. Cronin. Do you still like The Citadel? I feel sad about some of the books I never got back. I will look forward to reading your conversation with Victoria soon 🙂 Been missing her for a while – she always gives insightful, indepth comments which are a pleasure to read. I haven’t read ‘The Citadel’ recently, but I loved it when I first read it as teenager. It is about a young doctor who goes to practise in an English village and falls in love with the schoolteacher. I should read it again one of these days. I always enjoy Victoria’s comments as well. She’s not always around. I need to visit her blog more often. Her posts are alwys very interesting. I saw that The Citadel is available again, btw. I think either my mother or my grandmother loved him because I sem to remember seeing his books on our shelves at home. Lovely post, Caroline. I wasn’t able to buy books with my own money ’til I was around 10, so it was probably a Nancy Drew book. I still love mysteries to this day. Thanks, Carole. I think the books we read as children do have an influence. I’ve never read a Nancy Drew. I’m glad you enjoyed it. All the comments make me remeber even more. There were a couple of reasons that brought back the memory. I passed by my old school a while back. The I bought a book by a cultural anthropologist and remembered a movie on the Inuit we watched at the uni and then I remebered Nuvat. 🙂 I have so many other book related childhood memories but this made me wonder if others remembered as well. Pop Corn and Ma Goodness sounds quite enjoyable. I guess those Saturday nights were something to look forward to. Thank you, Deepika. I’m glad you liked it. I don’t know the book you mention. But it’s funny, how those early memories stay with us, isn’t it? I guess it was a bit too chunky. The first really important book I bought was Dr. Zhivago by Boris Pasternak. I was only 12 when I read it , but it made a lasting, life-long impression. It’s never too early for good literature. 🙂 And you even bought that yourself. I was 16 when I started reading Russian literature. I have still not read it but I know it’s said to be very good. I’ve seen the movie. Not that one can compare that.